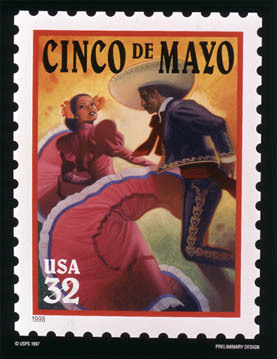 Now celebrated in the United States much as a gateway celebration opening the doors to summer, and an excuse to partake of Mexican fare and beverages portioned by tequila, “Cinco de Mayo” is still only regionally celebrated in Mexico where it is called El Día de la Batalla de Puebla. Marking the Battle of Puebla on May 5th in 1862, the date marks an important battle in Mexican history representing a victory in repelling French forces from the nation. Yet the date is only of marginal importance in Mexico. It is not independence day (Sept. 16, 1810). It does not even mark the end of the war against the French. What was significant, is that a Mexican force of only 4000 soldiers managed to defeat a better equipped and trained French army estimated at 8000. While oddly being celebrated more heavily in the United States than Mexico, the significance of the date seems to have been trampled in the rush for beverages. The day has been advertised as “Drinko de Mayo,” and in many ways seems to have become a less green and summer variant of St Patrick’s day. Celebrating the Battle of Puebla may be roughly equivalent in the United States to celebrating the Battle of New Orleans; while an important moral victory defending the nation from an invading European army, it was not decisive in the war. Nonetheless, the date marks a significant victory over foreign forces invading Mexico, and is regionally celebrated mostly in the state of Puebla, Mexico where the battle took place.